Two churches preceded the actual Romanesque church: the first of the 8th century, mentioned in a prayer of 1060, the second, a three-aisled basilica built by Bishop Hugh around 1030 to where the cathedral was transferred from S. Maria Maggiore in 1036 and of which the crypt and the bell-tower are still existing, while the nave stood underneath the actual church-square. The construction of the actual building begun under Bishop Clarissimus in 1134 by Giovanni da Gubbio. The front is of classical Umbrian-Spoletian style and is richly decorated with sculptures and bas-reliefs. The first paneled order ends with a cornice decorated with monstruous animals. A blind gallery is the base for the second order with a central rose-window, surounded by the four symbols of the Evangelists, flanked by a pair of smaller rose-windows. The subsequently built high tympanon has a blind pointed arch in his middle, planned to contain a mosaic which has never been realised. As you can see by the low position of the lateral rose-windows, the wall on top originally was sloping. The portals give evidence of a particularly rich sculptural decoration. The three-aisled basilica interior in 1571 has been drastically modified by Galeazzo Alessi in late Renaissance style. Hidden by the Renaissance vaults, the original barrel vaults are still intact. 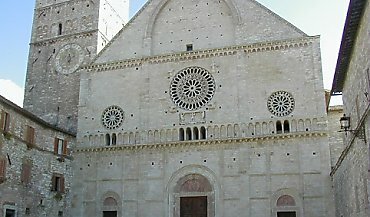 The only original element in the church is represented by the font at the beginning of the right aisle: in it have been christened St. Francis, St. Clare and Frederick II of Swabia, who had grown up in the imperial fortress of Assisi. On top of the last altar on the right, „Christ and saints" by Dono Doni (1555), by the same Assisian painter, at the two altars flanking the main one, „Deposition" (1563) and „Crucifiction" (1563). In the apse, the beautiful inlaid and sculptured wooden stalls by Giovanni di Pier Jacopo of S. Severino Marche. From the left aisle you get to the Roman cistern on top of which the belltower of 1036 has been built (contact the guardian). The entrance to the Museo Capitolare lies in the right aisle. The museum contains stripped frescoes from the Oratorio di S. Rufinuccio, probably by Puccio Capanna (1330-40), „Flagellation", „Crucifiction" and „Deposition"; furthermore, a fresco, „S. Antonio di Padova", and a tryptych, "Our Lady with Child and saints" (1460 or 1470) by Nicolò di Liberatore, the Alunno; reliquiaries, illuminated codices and capitals of the pre-existing church. At the desk of the museum you may also buy the ticket for the visit of the Crypt to which you acceed from the exterior of the church. It is part of the church built by Bishop Hugh of which the nave is located underneath the actual church-square. The columns and also a part of the capitals are antique Roman remains. According to tradition, the sarcophagus with the myth of Diana contains the corps of St. Rufinus. The vault of the apse is decorated with the remains of frescoes representing the symbols of the Evangelists (11th -12th century).